I like travel logs. I enjoy reading them and I have written a few myself over the years. I recently visited the Wisconsin Dells for the first time in several years and I saw first hand the power of water on the shores of Lake Delton. In the below photo I should be 8 feet under water, but after an embankment gave away, the entire Lake drained out in less than an hour – now visitors wander about on what used to be part of the lake. When the man-made lake drained, they found several guns but no dead bodies were found (which is a good thing!). The guns were turned over to the state Crime lab for testing. Chicago is only 3 hours away so anything is possible… it was a favorite spot of gangsters during the 20’s and 30’s. So what was I doing in the Dells? I was there primarily to work on a project for a customer, but I also got to visit some friends and see some sites. My buddy, Scott, worked in the Dells during his college years and always enjoys going back, so he drove down from Door County to hang out for a few days (some of you may remember that Scott sang at mine & Tanya’s wedding). On the day I left we were treated to a special tour of the H. H. Bennett photo studio in the Dells. It is believed to be the oldest photo studio in the US and the building has been around since 1875. Dave, our host and tour guide, worked in the studio until it was donated to the state as a historical site in 1998. Dave had an amazing amount of knowledge on the history of the studio and the way it was operated. Typical of most of the original portraits studios, the H.H. Bennett studio has a window set-up to allow natural light to illuminate the subjects since there were no strobes in the 1880’s. The studio has 100+-year-old cameras, tripods and a darkroom – it even has boxes that held plates and paper from manufacturers who were in business before Kodak was founded. For those non-photographers out there, that is pretty darn old! H.H. Bennett was a well-known portrait photographer but also did a lot of landscape photography, particularly of the Wisconsin River around the Dells. He discovered that 3-D stereoscopic photos of the Dells showed the area much better than regular photos, so he was extremely successful with his stereo views of the Dells and surrounding area. In fact, H.H Bennett’s photos helped turn the Wisconsin Dells into a travel destination. He was also an inventor, and one of his most famous inventions was a shutter that was able to stop motion. This was almost unheard of at the time and as a result, his most famous photo is that of his son, Ashley, jumping between two rock formations knows as Stand Rock in the Wisconsin Dells. To read more about H.H. Bennett, go to www.hhbennettstudio.com and www.wikipedia.com. Almost forgot to mention… those who know me (Bill) know I am a huge fan of architect Frank Lloyd Wright (FLW). He lived in Wisconsin and some of his most recognized structures are in the state, including Falling Water, Johnson Wax Building and Taliesin. One evening, Dave, Scott and I had dinner at Del-Mar, which is a 50-year-old restaurant designed by an apprentice of FLW. The architecture was reminiscent of a FLW structure and the food, ambience and the company were great. Next time I make it to the Dells I plan to stay longer and visit some of the FLW structures around. 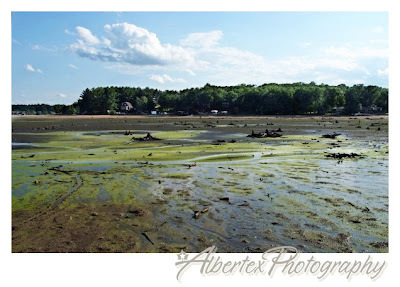 On a closing note, the loss of Lake Delton in the Wisconsin Dells has had a tremendous impact on the area and many usual travelers who would normally visit the Lake are canceling their trips. If you have ever wanted to visit, this is a great year to do it – with fewer people visiting, the lines are short and good deals can probably be found at many places. Ciao! As I have spoken about in previous posts, Bill has decided to work on two certifications this year and and he has already earned his CPC, so the next one is the CPP (certified professional photographer). Well, he finally received his results for the exam portion and he PASSED! YAY!!!!! He’s halfway there, just the portfolio submission left to do. Keep up the good work, sweetie… you have inspired me to start studying for the exam. I hope everyone had a good 4th of July weekend. We had a great turnout at our BBQ and everyone had fun – I think Bill is already planning next year’s party. I was a little sad that my brother Dave couldn’t make it from Canada – I guess he will have to wait until next year to experience a 4th of July party. For those of you who don’t know, I am from Canada and moved to Texas almost 6 years ago. My brother, Dave, has decided that he loves visiting Texas and he may want to move here one day. The only problem is he has never experienced a Texas summer. Growing up in northern Canada does not prepare you well for the Texas summer heat, so I was hoping he could make it down this year… I guess we will have to wait until Thanksgiving or Christmas to see him again. On a business note, I am ordering our first sample albums from a new album company that we are very excited about. They offer both flush mount albums as well as coffee table books and the coolest thing is that they offer a Metal Cameo for their covers. The metal cameos give a unique and luxurious look to the albums, we can’t wait to see our sample albums. We should have them in plenty of time for the next Star Telegram Bridal Show (August 17), so come by our booth to check it out! I am also posting a few of our fave photos from an engagement shoot last week… I know I said I wasn’t going to post many of our client’s images, but Niki & Jason were fantastic to work with and they have already previewed their images. PLUS, Jason is a fellow photographer so I don’t think he will mind too much :-). Can’t wait for the wedding at the end of the month, it should be a blast! To see their guest signature book, go to our wedding website and click on “CLIENTS” in the bottom right corner, then enter “engage” as the password. 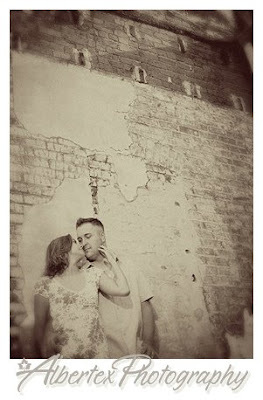 Niki & Jason liked the grunge look, so we found this great exposed brick wall to use as a backdrop. Most of you do not know this, but Bill has been studying very hard lately and it has paid off. In May, Bill earned his Certified Photographic Consultant (CPC) designation through the Photo Marketing Association. This certification focuses on mastering both digital and film technologies and is the highest professional recognition in the photo/digital imaging industry. Needless to say, we were very excited when Bill passed the first round of testing, in which he scored 92% on a 300-question exam. He then went on to score 98% on the final exam – way to go Bill.. I’m very proud of you and I love you! To learn more about the CPC, click here. Most people know that Bill has a B.A. in Photography, but many people aren’t aware that he has been passionate about photography as long as he can remember. He bought his first SLR camera at the age of 12 and photographed his first wedding while still in high school (yes, the old days of film!) Bill was fortunate enough to attend a junior high school that offered photography classes, and he went on to attended a magnet high school where he could continue studying photography. By the time he started university, he had an extremely solid base of knowledge, both technically and artistically. The other big achievement we have decided to start working towards is our Certified Professional Photographer (CPP) certification. This is earned through the Professional Photographers of America and involves two parts – a written exam and a portfolio submission. We drove down to Kerrville last week so that Bill could take the test and I hope to be ready to take the test myself in January. We are also working on polishing our portfolios and hope to submit those this summer – wish us luck! The CPP designation is open to all professional photographers, but only 3% of all photographers ever achieve this certification. This week has been pretty uneventful compared to our norm. After Bill took the CPP exam on Monday, we stayed an extra day in Fredericksburg TX (woo-hoo!) then drove home on Tuesday. Anyone who knows us is probably aware that we travel so much we rarely take an extra day anywhere – we just want to get home. Needless to say we had a great day, even if Bill had to spend half the day on the phone. Another thing that happened this week is that we found out a consulting job we were really looking forward to has been postponed until next year. We had blocked the month of October for a consulting job in Australia (how could we turn that down?!?) but it looks like they can’t make things work for this year. 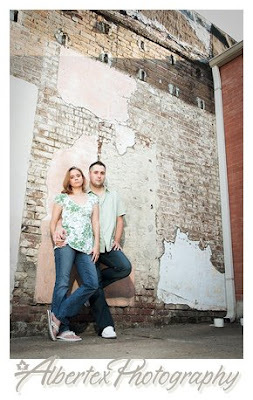 Now we are opening up the month of October for anything – weddings, portraits, corporate work… whatever comes our way! I am excited to see what happens and what our travel schedule will turn out to be. Last year in October, Bill and I did hit the DFW area, Washington DC, San Antonio, Houston, Jefferson City and Tulsa. Anyone who has worked with us knows that I like to compartmentalize my work to some extent. It can be very difficult to go from shooting a wedding one week to a 3 week location job the next, then back for 1 wedding, then back to corporate work. I used to book anything at anytime until I realized I was driving myself crazy. A few years ago I decided to regain control of our lives and block certain months for specific types of work. It has worked well and we have regained some sense of normalcy in our lives – we have actually had 4 weekends off so far this year! I guess my point with this is that opening October 2008 up to anything is going back to the way I used to take bookings, but I am feeling a little nostalgic this week so I think it should be fun and interesting to see what happens! I had a revelation today! The group of people turned around with great fascination, only to see Bill and I staring blankly at them. Well, we know we did the work, but by now it was just two more gigs from last year that we had packed into our vault of “past jobs”. The incident made me think… while we think the life we have chosen is just our life and nothing worth blogging about, maybe our stuff is interesting to others, so here goes! I would like to clarify something about the two jobs that Gene was referring to. First of all, we were not capturing Pulitzer Prize worthy images that were featured on the cover of NG – we were doing a corporate event at their headquarters in DC, photographing children on green screen and placing them in a new cartoon that had recently premiered on the National Geographic Channel. As for Microsoft, we were doing stock photography of employees for their marketing dept to use in internal publications. BTW, both jobs were referred by our good friend Scott Proposki, a fellow photographer in Boston – Thanks Scott! In between the corporate work, we did manage to photograph Brenda & Paul’s wedding in Houston and they were one of the most wonderful couples we have worked with to date. Their story and their wonderful families made a tremendous impression on us, and that is the most significant memory I have from that two week period. In fact, Brenda is the bride with the fabulous dress that I decided to make our “signature image” for this year – she is the first image on our website, she is on our current business cards and in our current ads. Now, back to our blog: I have spent countless hours enjoying other photographer’s blogs and have decided I like the ones that mix personal and work, so that is what our blog will be. I guess I feel that is most suitable to us because our lives are so completely intertwined with what we do for a living. We love what we do, so it rarely feels like we are working. You will see a mix of our corporate work, our weddings, and our family and friends – maybe a little bit of us thrown in for good measure :-). I debated whether I should post photos or not and have decided that I will do a mix – you will see some photos but it will be mostly blah-blah about what is going on in our lives and our work, and hopefully we won’t get too many virtual rotten tomatoes!